Although WMV is the most frequently used file format for storing media files, it's only accepted or supported by specific devices such as the Blackberry Bold series, etc. In comparison to an WMV, the AVI file format is more popular between devices like the PSP, PS3, Xbox 360 and much more. Therefore, you'll have to convert WMV to AVI if you wish to playback your WMV files on the AVI supported devices or applications. This article will show you a step-by-step guide on how to convert WMV files to AVI on both Windows and Mac OS (Mojave included). In order to maintain the video's quality during conversion, a professional yet easy-to-use WMV to AVI video converter is highly recommended. Convert WMV to AVI, MP4, MOV, FLV, and other 1000 formats. Edit, enhance & personalize your WMV files before conversion. Burn and customize your WMV files to DVD with free DVD menu templates. Wondershare UniConverter (originally Wondershare Video Converter Ultimate) is a very great helper in not only file conversions, but also with other areas such as online downloads, editing and DVD personalization. The steps required are quite similar in both Windows and Mac, here takes Windows as example. Step 1 Import WMV files to the WMV converter. Directly drag-and-drop your files onto the converter or click the Add Files button in the upper-left of the program's main interface to load WMV files. Multiple files could be added as batch WMV to AVI conversion is supported by this converter. Step 2 Personalize your WMV video file before conversion (optional). Click one of the editing icons under the video thumbnail, you'll be able to trim your video files in real-time before conversion, or personalize it with the effects available and then adjust the contrast, saturation or others accordingly. If you need to re-edit it, there's a Reset button at your convenience. Step 3 Select output format AVI. 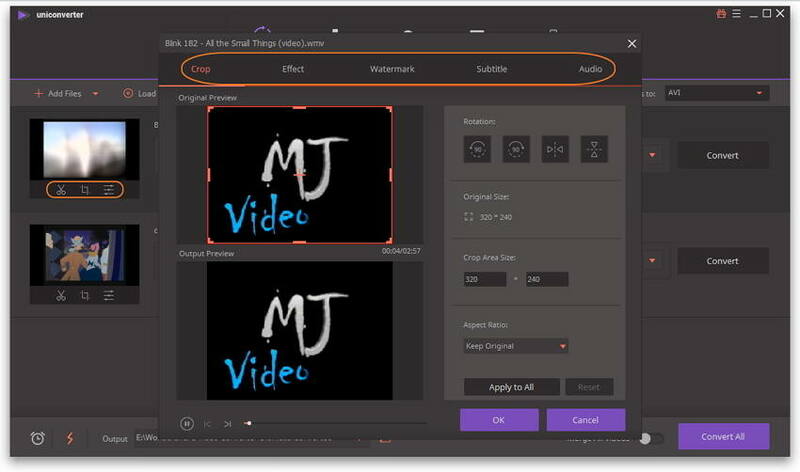 Click the down arrow button from the Target box and select the Video tab, choose AVI in the left sidebar and select the video resolution in the right to confirm the output format. If you intend to playback these converted files on a portable device, there's optimized presets to save you from browsing for the best format settings. Step 4 Start WMV to AVI conversion on Windows 10. Once you're ready, click on the Convert All button and let the converter take care of the rest. 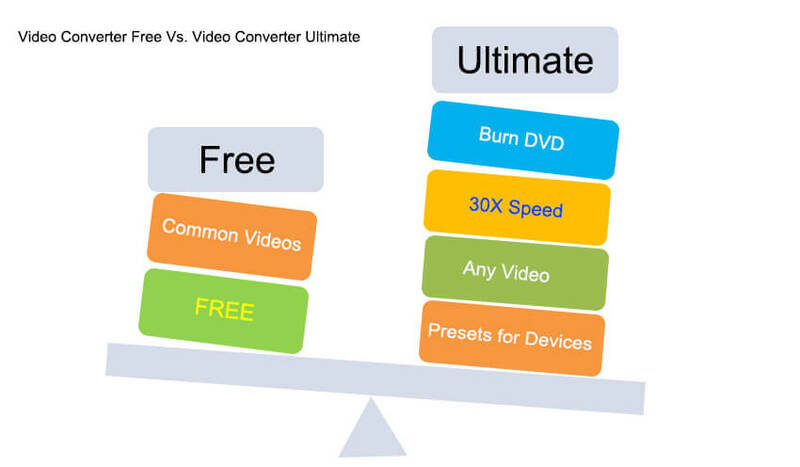 If all you need is a simple conversion with some trimming features, the free video converter is all yours! On top of that, you can still download your favorite music video from YouTube and convert it into an MP3 for your music library. 1. Only support the conversion with watermark. 2. Standard speed of conversion. 3. Some limitations to the advacned features. Speaking of online converters, you can give Zamzar a shot. It is accessible from any operative system and can be used from any browser. Other than that, Zamzar is compatible with a very wide range of file formats and offers you information about the input and output formats with a brief but complete data. Now let’s take a look at how it converts WMV to AVI via the steps below. Step 2: Click the drop-down icon to choose AVI as output format. Step 3: Enter your email address to receive the converted WMV file in .avi. Step 4: Click Convert to proceed with the WMV to AVI conversion. Note: in case your file has exceeded the upload limit of 50 MB, the software will ask you to create a profile to allow you to convert bigger limits. If you want to convert WMV to AVI online over 100MB, most of online converters will remind you of upgrading the premium service. For better conversion experience, you'd better choose a good desktop WVM to AVI converter to convert videos in batch and loslessly. 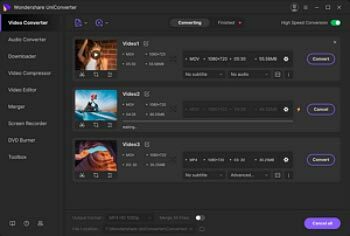 If you want to know more online WMV to AVI converters , you can refer to the article of 5 Free Video Converters to Convert WMV to AVI Online >.